When looking for an easy to assemble shed kit, do not over look the Arrow Ezee Sheds & Ezee Lockers. These sheds were designed with a time saving "snap together" assembly. To drastically reduce the amount of time need to put them up. Why spend half a day putting up your shed when you can put it up in a few hours and get to organizing your stuff inside that shed. One of the greatest time savers of this building is that the doors are ready to hang. You do not need to spend the extra time figuring out probably the hardest part of a shed installation. 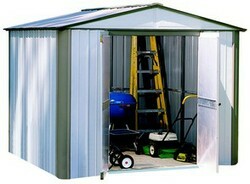 The Ezee shed series comes in 3 different configuration 8'x 6' , *' x 9' and The ezee locker 8' x 3.5'. Of course, all of these sheds are made out of 100% galvanized steel with a baked on enamel finish. This makes the Ezee shed family a tough and durable product. The EZ86 (8’x6’) provides 276 cu. ft. of space. Enjoy a tall 75 ¼” inside height for greater head room and increased work space. The EZ89 (8’x9’) offer a huge 431 cu. ft. of storage area. The large door opening (47 ¾” W x 65” H) will fit many riding mowers and other large equipment such as wheel barrows and snow throwers. In addition to yard and garden equipment, the Ezee sheds from Arrow make a great organized storage location for seasonal patio equipment, sport items, bicycles and much more including children’s toys and holiday decorations. The EZL83 (8’x3’) Ezee Locker offers convenient storage for tight, hard-to –fit places. You get 136 cu. ft in a unit that keeps your tools near where you need them. A slightly sloped roof allows placement against any outside wall or near a patio or deck. The Ezee Locker includes a floor frame kit which is perfect for a plywood floor finish (wood is not included). When finished, the floor frame helps keep your stored item off the ground and away from moisture. Also included, are four wide shelves for small cans and yard tools plus a handy tool rack. The tool rack lets you easily organize and store long-handle tools and features an exclusive small tool holder that slides randomly along twin steel tracks.